Desmoglein 3 (DSG3) is a calcium-binding transmembrane glycoprotein component of desmosomes in vertebrate epithelial cells. Currently, three desmoglein subfamily members have been identified and all are members of the cadherin cell adhesion molecule superfamily (1,2). Desmogleins exhibit membranous expression and connect with cytokeratins through desmoplakins and plakoglobin. DSG3 is particularly important in the cellular adhesion of squamous epithelium, and as a result, it is often highly expressed in various squamous cell carcinomas (SqCC) (3). In lung SqCC specifically, DSG3 has demonstrated a sensitivity of 85-100%, and an ability to discriminate lung adenocarcinoma (ADC) with a specificity of 98-100% (3-6). The mouse monoclonal antibody p40 [BC28] recognizes an epitope unique to the p40 protein and may have applications in cases where p63 has traditionally been used. To date, p63 [4A4] has been a frequently used marker for lung SqCC, as well as for bladder, breast, prostate, and head and neck cancers. p63 [4A4] recognizes both the p63 and p40 proteins (7). As a result, p63 [4A4] has proven to be a sensitive marker for lung SqCC; however, it suffers from specificity limitations due to reactivity in a subset of lung ADC. In contrast, p40 is selectively expressed in lung SqCC, offering an opportunity for improved specificity (5-8). p40 (M) [BC28] recognizes an epitope unique to p40, which may result in diminished reactivity in lung ADC and increased specificity (8). 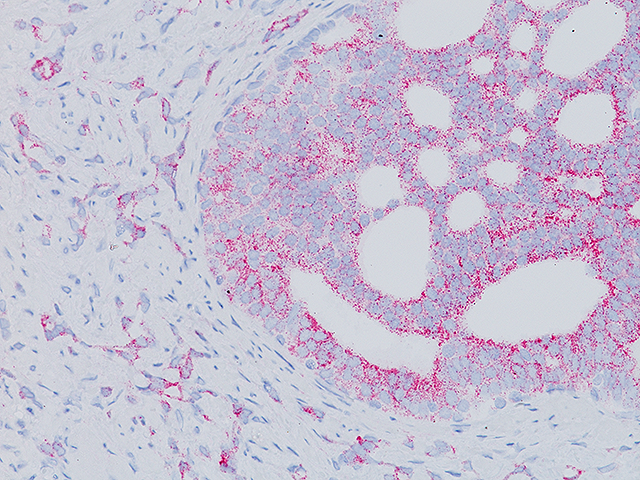 The combination of both membrane and nuclear staining of DSG3 and p40, respectively, may increase overall sensitivity for lung SqCC and, in some cases, may aid the pathologist with difficult specimens (4,5). 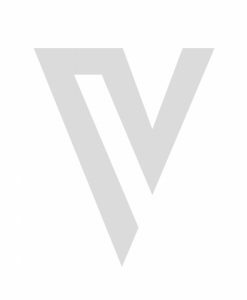 Napsin A is a pepsin-like aspartic proteinase. It is expressed in most lung adenocarcinomas and some renal cell carcinomas, as well as in type II pneumocytes (4-6). Studies have shown that Napsin A is a more sensitive and specific marker than TTF-1 and is extremely specific for lung ADC versus lung SqCC (4-6). 1. Buxton RS, Magee AI. Structure and interactions of desmosomal and other cadherins. Semin Cell Biol. 1992 Jun; 3(3):157-67. 2. North AJ, et al. Molecular map of the desmosomal plaque. J Cell Sci. 1999 Dec; 112 (Pt 23):4325-36. 3. Savci-Heijink CD, et al. The role of desmoglein-3 in the diagnosis of squamous cell carcinoma of the lung. Am J Pathol. 2009 May; 174(5):1629-37. 4. Tacha D, et al. 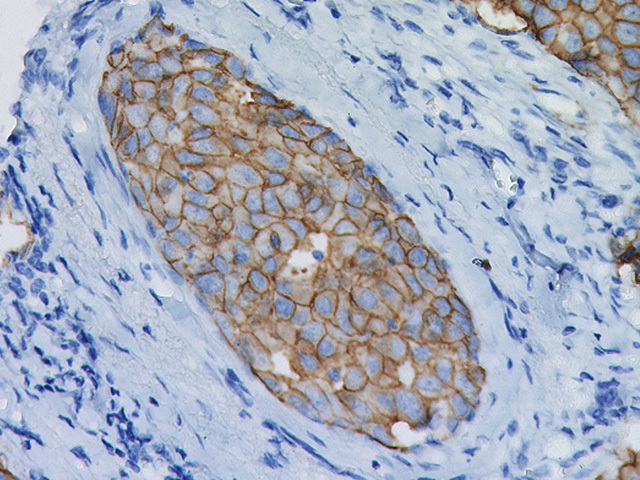 A six antibody panel for the classification of lung adenocarcinoma versus squamous cell carcinoma. Appl Immunohistochem Mol Morphol. 2012 May; 20 (3):201-7. 5. Brown AF, et al. 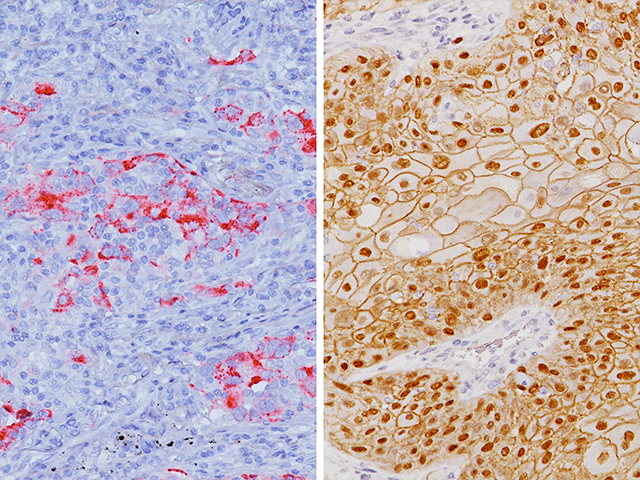 Tissue-preserving antibody cocktails to differentiate primary squamous cell carcinoma, adenocarcinoma, and small cell carcinoma of lung. Arch Pathol Lab Med. 2013 Sep; 137(9):1274-81. 6. Agackiran Y, et al. 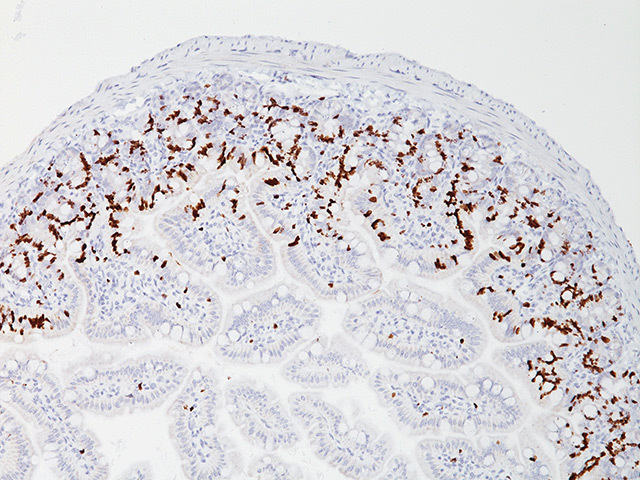 Desmoglein-3 and Napsin A double stain, a useful immunohistochemical marker for differentiation of lung squamous cell carcinoma and adenocarcinoma from other subtypes. Appl Immunohistochem Mol Morphol. 2012 Jul; 20(4):350-5. 7. Bishop JA, et al. p40 (ΔNp63) is superior to p63 for the diagnosis of pulmonary squamous cell carcinoma. Mod Pathol. 2012 Mar; 25(3):405-15. 8. Tacha D, et al. 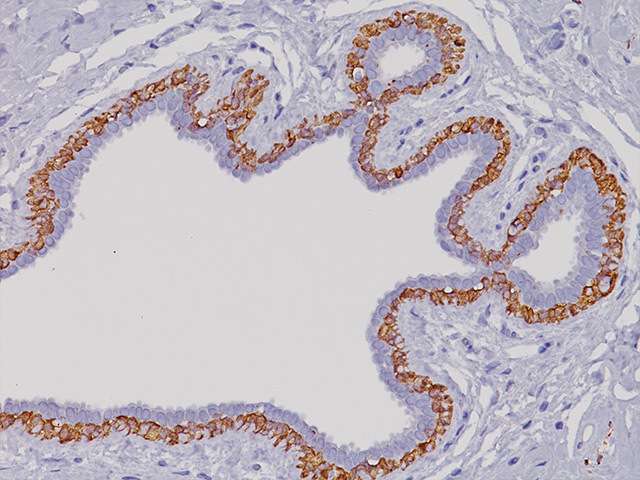 An immunohistochemical analysis of a newly developed, mouse monoclonal p40 (BC28) antibody in lung, bladder, skin, breast, prostate, and head and neck cancers. Arch Pathol Lab Med. 2014 Oct; 138(10):1358-64. 10. Clinical and Laboratory Standards Institute (CLSI). Protection of Laboratory Workers from Occupationally Acquired Infections; Approved Guideline-Fourth Edition CLSI document M29-A4 Wayne, PA 2014.